You Are In Your Mercury Period! Mercury, the messenger of the gods, symbolizes mentality: our intellect and mental outlook, the way we think and communicate. Mercury rules all forms of communication, whether via writing, letters, email, media, film or multimedia, and by speaking, on the phone, via internet, or in person, whether one-to-one, or by addressing groups. It is responsible for commerce, trade and transportation. All above abilities and activities will be affected by your card in Mercury. 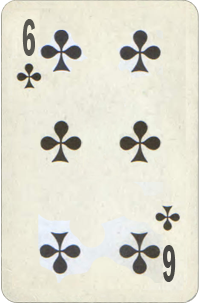 Six Of Clubs Basic Meaning: The card of Intuition. Mental balance and peace. Responsibility in speech and communications. Compromises. Karmic debts to pay (for what you've said or promised) to achieve mental stability. High side: Awareness of higher purpose in life, sharing knowledge with others.